DEVELOPER Harry Triguboff’s Meriton group is releasing revitalised waterfront apartments for sale on the in-vogue Rhodes peninsula this weekend. The 68 apartments are in Aqua, six level buildings fronting the Parramatta River that were completed nine years ago. The release comes eight months after Australia’s largest high-rise developer successfully released 59 reinvigorated apartments directly next door which were met with unprecedented demand from locals, many of which were anticipating the release. The Aqua release comes as Riverview nears a sell-out. “Among the great positives for buyers at Aqua are the uninterrupted water views. “Situated on the northern tip of the Rhodes Peninsula, Aqua offers resident’s privacy and tranquillity away from the density, but remains central with quick access to transport links such as the Rhodes train station and the Meadowbank Wharf. Aqua boasts the largest apartments currently on the market for sale. Many of the one, two and three-bedroom layouts boast studies. One-bedroom floor areas range up to 95sqm, two-bedroom floor areas range up to 232sqm and three-bedroom layouts up to 247sqm, resembling house-like proportions. The apartments have grand enclosed entertaining areas, wrap-around balconies, or garden courtyards and come in one and two-level configurations. The extensive upgrades undertaken by Meriton include, but not are not limited to; new stainless-steel SMEG appliances, plush carpets, energy saving LED down-lights and contemporary bathroom fitouts. 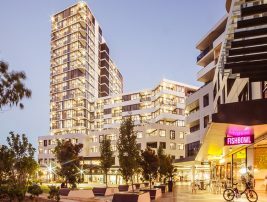 James Sialepis, the Meriton director of sales, said that Meriton were offering existing residents an exclusive opportunity to purchase the apartment they live in prior to the public release. “At present we’ve received positive feedback from our tenants, which is a testament to Aqua’s appeal. Mr Sialepis said the Aqua apartments always had been in high demand in the rental market. Aqua apartments were achieving rents up to $950 a week. Aqua is adjacent to Mill Park and fronts a foreshore walking and track which leads to Sydney Olympic Park, where Meriton is enjoying major success. Prices at Aqua will start at $550,000 for a one-bedroom apartment, $850,000 for a two-bedroom and $1.580 million for a three-bedroom.